A night after MSNBC's Keith Olbermann demanded Senator Joe Lieberman "just resign already" as he shrieked "you are embarrassing humanity! ", CBS joined in targeting Connecticut's "independent Democrat" for daring to oppose liberals on health care. "He holds the 60th vote needed to get the health care reform bill passed in the Senate," anchor Katie Couric intoned, "and Nancy Cordes tells us supporters of reform are angry and confused about Lieberman's position." A frustrated Cordes concluded: "So this small group of four or so Senators has managed successfully to impose their will on the other 530 members of Congress because the changes that they're demanding to the Senate bill will likely have to be made to the House bill, too." The proposal to allow younger Americans to buy into Medicare had been crafted specifically as a compromise for Lieberman and other moderates who had opposed a public option. The Connecticut Senator has championed the buy-in idea for nearly a decade, and reiterated his support just three months ago....What's especially mystifying, Senators say, is that Lieberman has historically sided with liberals on domestic issues. KATIE COURIC: Now, more about the Senator Chip [Reid] mentioned in his report, independent Joe Lieberman of Connecticut. As Chip said, he holds the 60th vote needed to get the health care reform bill passed in the Senate, and Nancy Cordes tells us supporters of reform are angry and confused about Lieberman's position. NANCY CORDES: Even close colleagues of Senator Joe Lieberman were at a loss today to explain his apparent about-face. SENATOR DEBBIE STABENOW (D-MI): I have no idea. CORDES: After all, the proposal to allow younger Americans to buy into Medicare had been crafted specifically as a compromise for Lieberman and other moderates who had opposed a public option. The Connecticut Senator has championed the buy-in idea for nearly a decade, and reiterated his support just three months ago. SENATOR JOSEPH LIEBERMAN (I-CT): What I was proposing was that they have an option to buy into Medicare early. CORDES: But this week he suddenly threatened to block the health care bill if it contains a Medicare buy-in, throwing the entire process into disarray yet again. SENATOR SHERROD BROWN (D-OH): I'm very disappointed because I thought we had Senator Lieberman's staff in the room, I thought we were gonna, during the negotiations, I thought he would go along with it. CORDES: What's especially mystifying, Senators say, is that Lieberman has historically sided with liberals on domestic issues, even though he became an independent in 2006 after losing his Democratic primary. JIM SHEA, THE HARTFORD COURANT: No one can understand exactly what Joe's up to with this. You know, there's some people that think he's, you know, that he's grandstanding. There's some people who think he's, you know, kowtowing to the insurance industry. CORDES: The industry does have a large presence in Connecticut and gives generously to his campaigns. But Lieberman is hardly the only moderate putting the brakes on the bill. 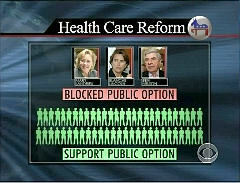 Democratic Senators Mary Landrieu, Blanche Lincoln and Ben Nelson - who come from conservative states - successfully blocked the public option even though the other 55 Democrats support it. Nelson is still holding out for stricter anti-abortion language, leading some liberals to complain their agenda is being hijacked by a few. CORDES TO LIEBERMAN: Does it trouble you that you're going against an overwhelming majority of your caucus? LIEBERMAN: Well, it's not fun. I said that to my colleagues at the White House. I haven't enjoyed it. But you've got to do what you think is right. CORDES: So this small group of four or so Senators has managed successfully to impose their will on the other 530 members of Congress because the changes that they're demanding to the Senate bill will likely have to be made to the House bill, too. Katie? COURIC: And, Nancy, how does Senator Lieberman explain that he supported allowing people to buy into Medicare as recently as September? CORDES: Well, he insisted today that he hasn't flip-flopped, the that the Medicare-buy in is something that he supported years ago back when the economy was better than it is now before there was another health care reform bill that does so many things to make health insurance affordable for older people. COURIC: Meanwhile, Nancy, as you mentioned, there are plenty of Senate Democrats who feel very strongly about a public option. Could their support be lost if there isn't one in the bill? CORDES: Well, there are a couple of Senators - Senator Roland Burris of Illinois or Bernie Sanders of Vermont - who say it would be very difficult for them to support a bill if it doesn't contain a public option? But they stopped short of drawing a line in the sand the way that Senator Joe Lieberman did so it does look like there is some wiggle room there.